All G7 economies are struggling in the post-crisis climate, but US GDP has recovered to pre-crisis levels, while the Eurozone simply hasn’t. This column portrays the global crisis as a transitory shock for the US, but as a quasi-permanent shock for Europe. The policies that are needed get the Eurozone back on track do not seem to be politically feasible. As tension rises with every quarter of stagnation, prospects for the survival of the euro are not only not improving, they are actually getting worse. Despite apparent calm on the financial markets, no illusions that the storm is ending soon should be entertained. Indeed, we may well be in the eye of the hurricane. A calmness settled when Mario Draghi pledged that the euro was an irreversible project. Yet, the forces that could eventually break up the Eurozone are not only untamed but are growing in strength1. Partly due to serious policy mistakes made by European leaders, ‘asymmetric shocks’ have grown since the beginning of the crisis, and the Eurozone still lacks a credible means of dealing with them ex post. A useful starting point is to compare how the US and Eurozone have been affected by and have responded to the recent financial crisis. 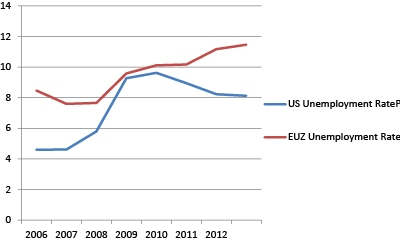 The goods and labour markets show an instructive comparison between the US and the Eurozone. The financial crisis originated in the US and later spread to the Eurozone and elsewhere. The US economy started recovering from 2009, while in the Eurozone recovery has been short-lived, and flattens out in 2010. As a result, US GDP in 2012 is above its 2006 level by 7%, while the Eurozone’s output in 2012 exceeds its level in 2006 only by 2%. Source: Author’s calculations based on World Economic Outlook. 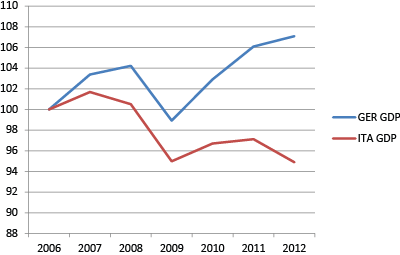 The labor market comparison tells an interesting story: the picture below describes the rate of unemployment in the US (blue line) and in the Eurozone (red line). Source: Author’s calculations on World Economic Outlook. First, note that the rise in unemployment in the US is on impact much larger than in the Eurozone, despite the fact that the latter experiences a larger drop of output. The data is therefore consistent with the presence of labour hoarding in the Eurozone relative to the US, possibly due to higher firing cost in the Eurozone. Second, following the sharp rise in the rate of unemployment in 2007-08, the US rate starts to decline in 2010, although there is little progress in 2012. Third, by contrast, the European unemployment rate rises relatively more smoothly since 2008, but shows no sign of reversal. The evidence so far points to much more persistent contractionary effects in the Eurozone than in the US. The global crisis seems to have been a quasi-permanent shock for the Eurozone but a transitory shock for the US. It seems that we are in for another round of ‘hysteresis’ in Europe, similar to what happened after the first oil shock in 1973. The question at this point is: to what extent this is a reflection of different policy stances in the Eurozone and the US? Or it is due to other economic factors? As a consequence, the debt/GDP ratios that were approximately at 70% in both the US and the Eurozone start diverging since 2007, with a much larger rise in the US (see Figure 4). 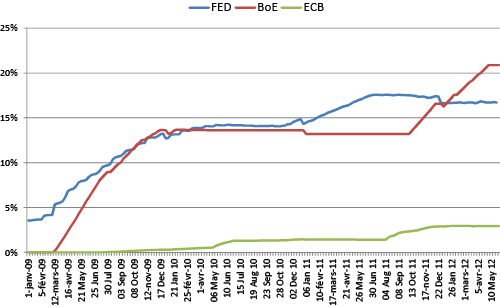 The size of the ECB interventions is about one fifth of that of the Fed, about 4% of GDP compared to over 20%. Source: Gross et al (2011). 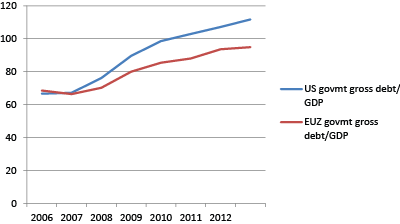 Assuming very conservative fiscal multipliers, the difference in fiscal stances between the US and the Eurozone (seven points of GDP from peak to trough) goes a long way in accounting for the worse performance of the Eurozone compared to the US (five points of cumulative growth) even without considering the strikingly less aggressive European monetary policy. This suggests that Eurozone problems are largely homemade. Yet, this does not imply that the euro may be at risk. Not yet, anyway. For that, we must turn to asymmetries. In 2012, GDP in Italy is 6% below its level of 2006, while in Germany is 8% above its level of 2006, a difference much larger than that we saw between the US and the Eurozone as a whole. Unfortunately for the Eurozone, this pattern is general. In order to construct a synthetic measure of GDP dispersion, I have calculated, for each year from 2006 to 2011, the coefficient of variation – the standard deviation normalised by the mean – between the US states’ GDPs (from the FRED data bank of the St. Louis Fed) and between the Eurozone countries’ GDPs (data from the most recent World Economic Outlook). The picture below shows the results, with the initial values normalised to one. Source: Author’s calculations on WEO and FRED data. There was a remarkable rise of the index of dispersion within Europe (i.e. between Eurozone countries’ GDPs). Between 2007 and 2012 this index grew by more than 2%. The dispersion between US states actually falls from 2007 to 2011, by almost 1%. Unlike in the US, countries in Eurozone were strongly hit by country-specific shocks: fiscal and current account imbalances in Greece, credit boom and banking crises in Ireland and Spain, and productivity growth in Portugal and Italy. Unlike the US, in the Eurozone fiscal tightening was stronger precisely in countries suffering larger negative shocks. Unlike the US, Eurozone countries have segregated labour markets with different degrees of employment protection, different systems of wage bargaining, and different banking and welfare systems. This affects the response of the economies to shocks (this is a long and old story: see Blanchard 2000). The Eurozone policy response to the crisis, fiscal tightening and reinforced constraints on Eurozone national borrowing to prevent moral hazard, is not only imparting a recessionary impact on the Eurozone, but it is also aggravating the ‘original sin’ of the euro: asymmetry. Thus, in a context of scarce international labour mobility and lack of wage and price flexibility in some Eurozone countries, the lack of an operative ex-post transfer/insurance scheme becomes even more serious. The problem is a very difficult one. A centralised ‘ex-post’ transfer scheme is necessary, but does not seem to be politically feasible. The adopted Macroeconomic Imbalances procedure, a mere ‘ex-ante’ monitoring device – akin to a score board – for detecting ‘asymmetries’ is probably counter-productive. Instead of transferring resources to countries suffering shocks, it punishes them. The longer-term prospects for the survival of the euro not only are not improving, they are actually getting worse. Gros, Daniel, Cinzia Alcidi, and Alessandro Giovanni (2012), “Central Banks in Times of Crisis: The FED versus the ECB”, European Parliament, Directorate general for internal policies, policy department A, economic and scientific policies. Blanchard, Olivier (2000), “The Economics of Unemployment, Shocks, Institutions, and Interactions”, Introduction, Lionel Robbins Lectures, London School of Economics, October. 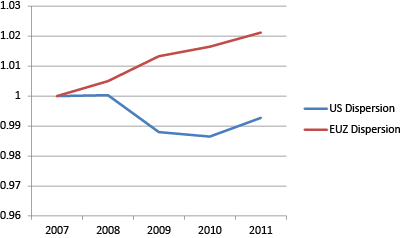 Manasse, Paolo (2010), “Stability and Growth Pact: Counterproductive Proposals”, VoxEU.org, 7 October. 1 This note is based on a talk that I gave at the Conference “America: Still A European Power?” in Bologna, jointly organized by Johns Hopkins University-SAIS and Bologna University. The title of my presentation was “Why and How the US and the EU Did/Didn’t Come out of the Economic Crisis”. 7 Responses to "Eurozone Crisis: It Ain’t Over Yet"
The amount of the necessary ex-post transfers from Germany and other northern countries to the south are just too big. If You look at the deficits of the troubled countries and at the trade deficits, You need about 120 to 150 Bill Euro every year to support this. For Germany this corresponds to an increase of the VAT of about 15 to 20%. No government could do a such dramatic rise, ever. Even in the US the New Yorkers wouldn't be pleased by a VAT increase of 15% to support California, for example. Also if You look at the whole time horizon since the beginning of the Euro, You will see, that Germany does not have such a good GDB increase compared to other members of the Eurozone at all. Especially the income increases are much less as for example those of the Greece people. Most Germans experienced a real loss of income, since the euro was introduced, and they are not willing to bear much more burden. The German politics tries to hide the burdens as good as they can, and they cannot incease that burden much more than now. GDP is not everything. 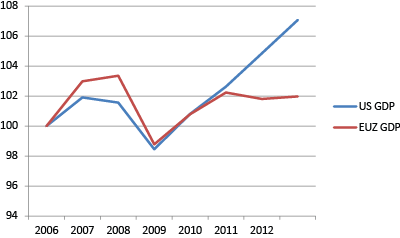 Greece had before the crisis almost the same GDP per capita as Germany. Most of it was a balloon blown up by sovereign loans financing the deficit. US is in similar situation as to the GDP. Its GDP partly is financed by loans from China, Japan, etc. While Europe has no significant net accumulated debt to foreigners, US foreign debt is about 1/3 of its GDP. To continue this trend USA will have to sell its assets, as any other deeply indebted entity. And here we come to the question, what is better, to have positive cash and no assets or to have a lots of assets and negative cash. It of course depends on the proportions. To me it seems Europe is better on it in both aspects. Manasse writes: "It seems that we are in for another round of ‘hysteresis’ in Europe, similar to what happened after the first oil shock in 1973. The question at this point is: to what extent this is a reflection of different policy stances in the Eurozone and the US? Or it is due to other economic factors?" He is right to point to differences in labor laws as one major reason why hysteresis is worse in some countries than others, and in the eurozone than in the US. I would add that if we look within the EU, more flexible labor markets also help explain why the Baltic states have recovered better than the southern-tier euro countries, despite the similarities of fixed exchange rates and austerity policies. The graphs of GDP are nice, but are the both rebased to the same currency? It seems not, in which case US GDP is artificially inflated relative to EU GDP over this time frame since the Euro strengthened relative to the US$. In general currency policy creates a noisy influence on GDP, which makes it very hard to make such a comparison based on GDP. Another thing to consider is that the US credit crisis was to quite a large extend exported to foreign holders of toxic assets, whereas the EU credit crisis was not and mostly stayed in EU. The US credit crisis has been partially paid for by large foreign losses on US assets. That is why EU banks collapsed in the US subprime crisis, but no US bank collapsed in the EU credit crisis. All in all there are as usual many more variables at play then just one: government policy as a response to the crisis. 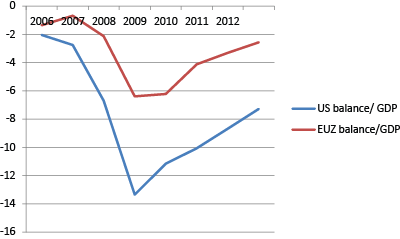 The employment rate on several European countries particularly in Germany had increase since the European crisis had started. The crisis is not yer over since we can still feel its effects, the economy might shown a slow improvement but still it is not enough to say that the crisis is over.